On Thursday evening, August 20, the 15-hour-old moon is actually lower in the sky than the sun. Note the shallow angle which the ecliptic makes with the horizon and that the moon is well south of the ecliptic. In ancient times, the first sighting of the new moon eachmonth was an important marker on the calendar. Even today, many religions basetheir feasts and festivals upon the appearance of the new moon. Except when there is a solareclipse, the new moon is not actually visible or observable, because it isso close to the sun in the sky, and backlit as well. Last month, new moon fell on July 22, and the moon wasexactly in between the sun and the Earth, so that its shadow fell on thesurface of the Earth, causing a solar eclipse widely observed in India andChina. This month, new moon falls on Aug. 20 at 10:02 Universal Time (6:02 a.m.Eastern Daylight Time). The time of new moon is determined by the geometry of sun,moon and Earth, and takes place at exactly the same moment everywhere on ourplanet, although the local time depends on your time zone. This month the moonis well south of the line joining the sun and Earth, so there is no eclipse. Most of the time, the closest we can get to observing thenew moon is on the first evening or two after the exact date and time of newmoon, after the sun has set but before the moon sets. This month, astrange thing happens on the first evening after new moon. Even though it?s more than 15 hours past new moon, the moonis actually lower in the sky than the sun. In Starry Night we can seewhy this happens. First of all, in August, the ecliptic (the line the sun andplanets follow through the sky) is always at a very shallow angle to thehorizon. Secondly, the moon?s orbit is not quite in the same plane as that ofthe Earth, so the moon spends part of the time above the ecliptic, part of thetime below. Currently the moon is low to the ecliptic, whereas a few months agoit was high at this time of the month. The combined effect makes the moon lowin the evening sky in August and high inthe evening sky in April. The appearance of the moon is affected by the angle atwhich the sun illuminates it. 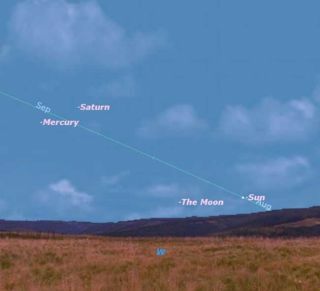 This month, its position not much higher in thesky than the sun means that its crescent is almost vertical, with its cuspspointing away to the east, away from the sun as always. Back in April the moonwas almost directly above the sun and lit from below, so that the cusps pointedstraight up from the horizon. Whenever the moon is in one of these extreme positions,people always ask astronomers if there is something ?wrong? with themoon. They don?t realize that the moon is simply obeying simple rules thatthey are unaware of. Back to spotting the new moon this month. If on Thursdaynight the moon is lower than the sun, there?s no way that we can see it. But onFriday night, the moon has moved farther away from the sun. It?s still low in thesky, but now it?s higher than the sun, so there?s a good chance you can spot itif you have a clear western horizon. Look above and to the left of the sun assoon as the sun dips below the horizon, and, with a little luck, you shouldspot the moon. A thin crescent moon is always accompanied by the ?the oldmoon in the new moon?s arms? : the ghostly full disk of the moon illuminatedby earthshine, sunlight reflected from the earth. This is readily visiblewith binoculars, but usually visible with the naked eye too, if the sky isclear near the horizon. If you spot the moon, be sure to look just above it to seeif you can also see the planets Mercury and Saturn. If you don?t manage to see the moon Friday night, try againon Saturday. By then it should be an easy object. Either way, you will haveseen the moon as a very thin and beautiful crescent.